Project Highrise – Management can be fun! Might benefit from a wider palette - More tile sets to add variety to different challenges? Interact with your family occasionally, possibly you can multitask with 'Eat'. Offices – Different industries and different sizes, and every occupant has their wants and needs. Residential spaces – Apartments of different sizes – Basic, standard, luxury – Even penthouses!!! Retail – Various sizes of stores offering services, food and other products to consumers to encourage them to visit, or to buy dinner on the way home! Eateries Lunch stands, cafes, restaurants of different sizes, and cuisines, serving snacks, breakfast, lunch and dinner depending on the type. Residents want to enjoy themselves, and businesses like to take people out to dinner, while they also bring visitors. Money – you start with some, you spend it to build and service the building, and receive it as rent. Prestige – How popular and prestigious your tower is – Do the ‘In’ people and cool businesses want to be seen to be in your tower? Buzz – Promotion, gossip – How high the profile of your tower is int he greater city – This can be spent on promotional campaigns to lower costs, improve footfall or other things. There are some nice tutorials to help you get started, and of course there’s an advisor who will helpfully, if slightly condescendingly point out what you should be looking at. The tone is quite positive overall, and a little bit hip – A little art deco, a little modernism, a dash of 50s futurism, 60s swing and a dash of the 80s drive to make it a little timeless, overall. If you’ve watched Mad Men, though, you’ll probably get it. 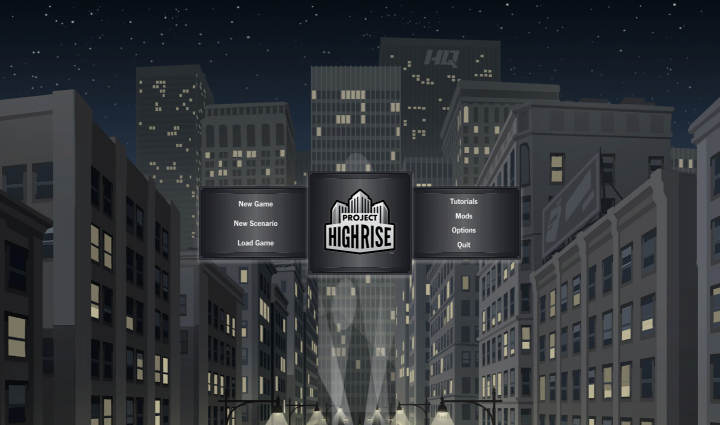 The basic game in Project Highrise just gives you a plot of land – You can use the money you start with (Lower difficulty level means more starting money) to build and invest in facilities. As your tower grows, you find that the more people are paying, the more services they expect, strangely enough! Services (Cleaning, maintenance, store rooms for retail shops, etc) have to be built underground, and you can only build so far down – Definitely not as far as you can build up! This makes for a bit of juggling, as I’m sure you can imagine. Utilities have to be provided, depending on the type of spaces you’re allocating – Electricity, Phones, Gas, Water – Even Cable TV! (Yes, it’s an American-styled game, in case you hadn’t guessed already). You also need to hire Lobbyists – Otherwise you can’t use your hard-won influence to bend the rules! Utilities don’t just need wiring – Each floor needs a wiring cabinet and a plumbing cupboard, and there are service rooms for them – Phone exchanges, switching boxes for the power, that define how many connections you can handle, so they need to be built (and take up space underground). It’s all very much a challenge. As you put in residential spaces and restaurants, there’s also bins and recycling. Please don’t think it’s all Rainbows and Unicorns!!! Everyone has an issue, everyone wants a break, and so it’s quite the juggling act, whether paused, running at normal speed or high speed. You’re juggling chainsaws that are calling you names and trying to spin faster so they can take your fingers off! 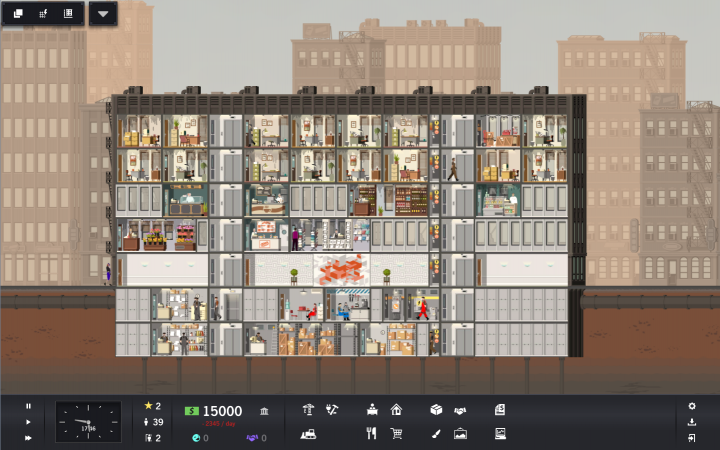 Project Highrise will not let you off the hook once it thinks you should know better! You also have a range of contracts you can take on, challenging you to achieve certain objectives, usually in exchange for money: Build a certain number of a certain size of offices, housing a certain mix of different industries, Achieve a certain maximum number of visitors, Take a certain amount in rent, etc. This means you’re working to have money in the bank, jump from challenge to challenge (You can have 2 contracts open at once, sometimes 3), and keep building within the limits of your plot and regulations to keep bringing in new people – Usually to meet your current challenge. If you’re not sure how well things are going, I’d recommend the satisfaction view to depress you – It gives you a chance to see who isn’t happy before they move out. Individual visitors can be clicked on for a status report, as can apartments, offices, etc. Did I mention that you have a maintenance office, because your building gets tired after a while? This means you have to pay for them to refresh things, or you hear the screech of tyres as a tenant disappears off into the distance! And then to top it all off, Project Highrise has Scenarios – Usually a predefined building a bit further along, with tenants in place and limitations on the plot, and you’re challenged to make a success of it – It’s definitely a challenge! there’s lots of filters to see who’s happy or unhappy, if things are broken, if there are funny smells from restaurants or bins upsetting people – And financial reports. You can keep yourself very busy researching – Or you can play it by ear, That’s mostly me. It does mean you’re reactive at times, but it stops you from getting bored!!! Overall, I’ve enjoyed playing a lot – Sometimes I do well, sometimes badly – Sometimes both at once, depending on which scores and parts of the tower yo’re looking at! I’ve also lost a lot of time to it. A couple of days worth over a week or so of actual playtime. This is not a game you can successfully ‘spend 10 minutes on” unless you have someone shouting at you to stop playing and do other (boring) things. It’s rather engrossing. On top of this, just before the release date, the developers, SomaSim, and the publishers, Kasedo, have added in Mod support. As if it wasn’t threatening to eat my life whole already!! OK, so it’s not Medal of Honour, or Unreal Tournament. It’s definitely not Battlefield or Eve, either. It’s got a nice, clean visual style, slightly art deco, that doesn’t need a monster computer to run it, and can even be run in a window. I’ve not seen any issues with it’s performance, even with 70 storey tall buildings or above – It just runs smoothly, keeps track of things and makes sure to encourage or berate you as necessary. so far the only things that have gone wrong when playing this game have only occurred between my ears, and I’m running a computer that’s a couple of years old, and was only upper mid range when it was built. Project Highrise should run happily enough on most credible gaming PCs.They recommend a Core i7 with 4Gb of RAM, and a dedicated video card with 1Gb of VRAM, but it will run on an i5 with 2GB and integrated graphics, and takes up a mighty half a gigabyte on your hard disk – I think some triple A titles have textures bigger than that, and are nowhere near as much fun! 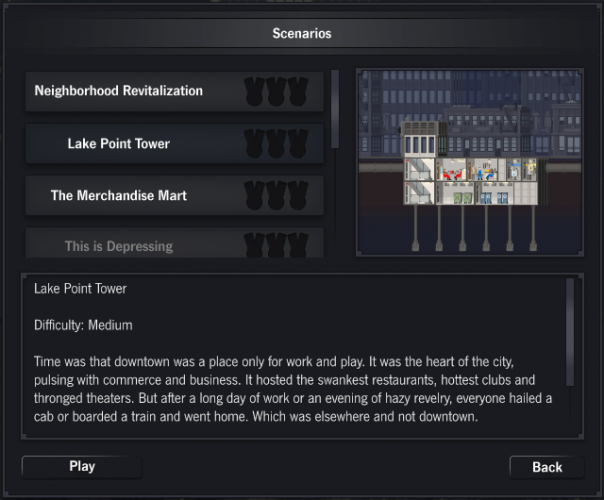 Overall, I admit that Project Highrise is probably not everyone’s cup of tea. It is, however, well written, fun and addictive. It fills a hole in my life I didn’t realise was there until I installed it and tried the first few tutorials. And now, with Mod Support, who knows what we’ll see next? Good old Steam Workshop, whatever did we do without it once upon a time?? I urge you to give this game a try – It may surprise you, when you suddenly realise it’s 3am, you’re off to work in a couple of hours but you just need to build 4 more floors…..
Have a look at Project Highrise on Steam to learn even more.